The Arenas had two West Highland Terriers, but when one died, it left both them and their remaining dog, Blizzard, bereft. Two years passed before the couple felt as if they were ready to get another dog. 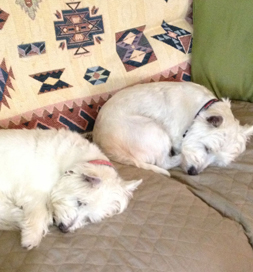 They first thought they would buy a Westie from a breeder, but then it occurred to them to take a look on Petfinder. Read the story in Kathie’s words. There the Phillipston, MA, couple found listings by Northern New England Westie Rescue, based in Manchester, NH, and saw both a Cairn Terrier and a Westie that interested them. “I exchanged many emails about both, and Penny from NNEWR was wonderful,” Kathie Arena says. “She suggested a five-year-old Westie male named Fritz.” They took her suggestion and adopted the cute white pooch. Blizzard, a senior “citizen,” “has pretty much adopted him as a little brother, and Fritz is very careful and considerate of her,” Kathie says. The Arenas are glad they made the decision to adopt him because of all the joy and love Fritz has brought to their family.